Raise your recliner for in-and-out ease. Handy recliner risers raise your chair's height by 3"–4" for confidence when you sit and stand with less strain on your back, hips, and knees. 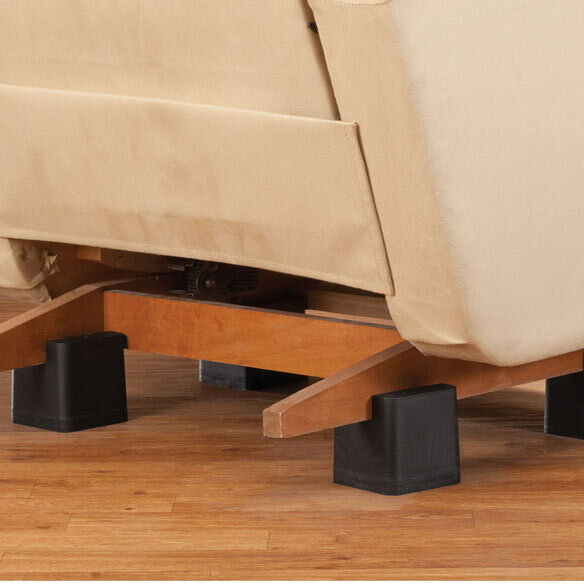 The furniture risers' reversible design allows you to choose from 2 installation methods: Use the slotted side with included adhesive to add 3" of height; or if your furniture has legs, insert them into the indented side for 4" of additional height. Non-skid material helps prevent slipping and sliding. When properly installed, this set of 4 chair risers supports up to 600 lbs. Two people recommended for installation. Set of 4 furniture lifts, each 3 3/4"sq. x 4"H.
Disappointed that these risers will not fit safely on my recliner due to a crossbar on my chair. However, I will use them in reversed position on my couch. Yes I have a new recliner and its a little hard for me to get up out of the chair. hoping the risers will make it easier for me to stand up. Hopefully will aid in lifting and seating for elderly parent. I had hip surgery and needed to raise the seat for comfort and safety. Looks like they will help me in my recliner after surgery. The feet on my sofa are too big for other risers. Have risers for my furniture with legs, but I needed risers for my recliner. I have two knee replacements and a hip replacement and these help me greatly. Because my recliner is to low to the floor. This will make it easier to up. I have 2 artificial hips and it is hard to get out of my recliner. I need it for my old recliner since I had hip surgery. My Roomba keeps getting stuck under the edge of my recliner. This should raise it enough to eliminate that problem. My Mother has fractured her shoulder and by increasing the high of the recliner she will be able to get up by her self. Obviously to help me get up from my chair. Finally found risers that will work on a lift chair, I hope. Have a problem with the front of the chair rubbing against the carpet. Hard to getout of low chairs! Because I have trouble getting out of my recliner because of knee problems and I didn’t want to buy A new chair. I was going to just built a platform but opted to be lazy instead. Football,s back! I just bought my husband a Lazy Boy recliner but it’s hard for him to both sit and get back up. I’m sure these will help him immensely. Can’t wait to get them. I will post back after we get them with a review if given the option!! Ease getting up from my favorite chair. I have an elderly father who has trouble rising from his chair. I thought this might help. Hope it does!! Need to raise recliner to make it easier to get up. To raise my husband's chair. Because it looks like the perfect solution for my 88 year old husband's difficulty in getting up from his recliner. Having foot surgery and needed more help getting up. I bought one pair and i love them. Makes getting out of my recliner much easier and sitting also easier. What is the size opening of the slotted sides? I need to make sure they are wide enough for my desk I'm trying to raise which has long rectangular legs. Thanks! BEST ANSWER: Thank you for your question. The rectangular space is 1 ¾” X 3”. We hope this information will be of help to you. Will this product work for a rocker recliner? BEST ANSWER: Yes, that is exactly what I have them on. They work perfectly. Are these risers ok to use on a recliner that has a metal base frame vs. wood? BEST ANSWER: As long as the runners will fit in the 1 inch slots on the riser, you should have no problem. My wife loves hers. She is now able to get out of the chair with ease. do not see any problem. there are two sided tapes to stabilize. Should stick to metal. The wood leg on my chair is 1" wide. 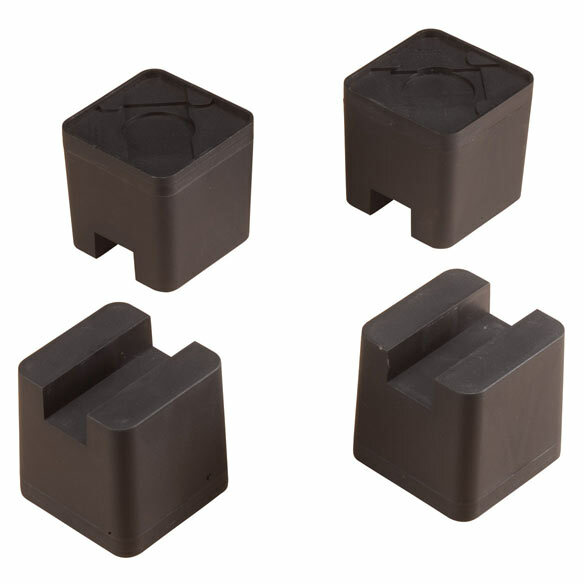 Will these recliner risers work? BEST ANSWER: Thank you for your question. The slot is 1 1/2" wide. Your recliner will fit in. We hope this information will be of help to you. My recliner does not have legs; it sits on a circular flat wooden base. Can these items be safely used with that kind of base? BEST ANSWER: Thank you for your question. No, this item will not work on your recliner. We hope this information will be of help to you. My chair does not have a wooden base it has metal legs. Can this be used on them? So, according to two answers below the opening (slot) in each riser is either 1 inch AND 1 3/4 inch. Which is it? It matters. Thanks. BEST ANSWER: Thank you for your question. The slot for the recliner base to fit in is 1 1/2” wide. We hope this information will be of help to you. Recliner risers fit round platform recliner? BEST ANSWER: Thank you for your question. No, we do not suggest you use these risers for round legs. We hope this information will be of help to you.